Guys, I have a PSA, and it isn't pretty. Put the chicken down. I don't care how fluffy it is, how lovingly it clucks, or if you're bidding it an emotional farewell before it becomes dinner. As Vox's Julia Belluz writes, a recent CDC alert about a salmonella outbreak in the United States warns that, and I quote, "[People] reported kissing or cuddling with the live poultry. These behaviors increase a person’s risk of a salmonella infection." Whoever writes the Centers for Disease Control's statements absolutely let out a deep sigh while writing that. In some American cities, owning chickens as pets is flat-out illegal, but others are just fine with it — and, just FYI, you probably shouldn't be. Any poultry, dead or alive, stands a decent chance of carrying the salmonella bacteria (hey, remember why you cook your roast chicken until all the pink bits are gone? ), and you can catch it just by touching said chicken. As Vox reports, more and more Americans are deciding that keeping a chicken as a pet is a really good idea, not to mention the bajillions (rough estimation) of chickens that grow up on American poultry farms, are cuddled aplenty, and then become the delicious produce you spot at your local grocery store. That's a lot of chickens running about the country. And chickens are cute! Don't get me wrong, I'm partial to anything that bobs its head adorably and is fluffy and starred in a heartwarming movie about escaping from the coop. But don't touch them! Don't cuddle them! And, for the love of God, don't kiss a chicken. I've had salmonella poisoning (from eating uncooked cake batter — and yes, that is why your mom tells you not to do that) and I wouldn't wish it on my worst enemy, let alone people whose hearts so full of love that they really want to kiss and cuddle the chickens chasing one another in their yard. The salmonella outbreak of June, which is now thought to be over, affected 40 states and was thought to be linked to people touching live poultry. It made 181 people sick; 33 of those had to be hospitalized. No deaths were reported from the outbreak. 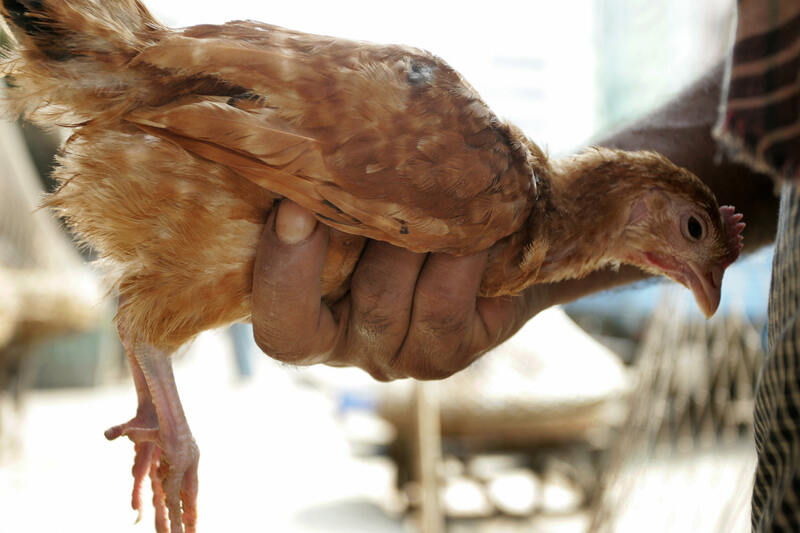 The FDA's advice to consumers was, essentially, try not to touch chickens. In interviews, ill people answered questions about contact with animals and foods consumed during the week before becoming ill; 82 (86%) of the 95 ill people interviewed reported contact with live poultry (e.g., chicks, chickens, ducks, ducklings) before becoming ill. Sixty-four ill people who had purchase records available reported purchasing live baby poultry from 17 different feed supply stores and hatcheries in multiple states. Ill people reported purchasing live poultry for backyard flocks to produce eggs or meat, or to keep as pets. Many ill people in these outbreaks reported bringing the live poultry into their homes, and others reported kissing or cuddling with the live poultry. These behaviors increase a person's risk of a Salmonella infection. Stop it, little guy! Go hug a nice puppy instead!